The Civil 3D training materials bundle includes all of the materials needed to improve your existing skills in the industry standardsoftware related to AutoCAD Civil 3D. 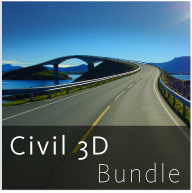 The bundle includes courseware for Civil 3D Introduction, Civil 3D Advanced, AutoCAD Map, Navisworks and Raster Design. The Civil 3D training materials bundle includes all of the materials needed to improve your existing skills in the industry standardsoftware related to AutoCAD Civil 3D. The bundle includes courseware for Civil 3D 2017 Introduction, Civil 3D 2017 Advanced, AutoCAD Map 2017, Navisworks 2017 and Raster Design 2017. Includes a 227-page online manual, 57 exercises and 21 instructional videos. This online training manual is recommended for drafters, designers, surveyors and engineers that are new to Civil 3D and those coming from Land Development Desktop. Learn the Civil 3D environment including style based objects, design constraints and defaults, and reactive dynamic design. Step-by-step exercises will demonstrate how to manipulate and understand the Civil 3D dynamic design objects for better control, faster design iterations, and a more accurate model. Learn to work effectively in Civil 3D across multiple drawings in a team project environment. Included in each chapter are project exercises and a “How Do I” section that contains frequently asked Civil 3D questions. Recommended prerequisites: AutoCAD Level I & II and familiarity with the surveying and civil engineering disciplines. Project Management, Toolspace, Styles, Data Shortcuts, Points, Sites, Parcels, Terrain Modeling, Labeling, Surface Creation, Introduction to Alignment and Profile Design, Basic Corridor Modeling, Cross Sections, Fundamental Grading, and Simple Volume Calculations. Topics not covered in this manual include: AutoCAD Level I and II, Map 3D and Land Desktop. Includes a 188-page online manual, 62 exercises and 21 instructional videos. This online training manual is recommended for drafters, designers, surveyors and engineers that have Civil 3D experience and/or have already taken the introduction course. Learn about advanced Civil 3D topics such as superelevation and pipe networks, and in depth functionality of alignments, profiles, corridors, and grading. Recommended prerequisites: AutoCAD Level I & II, and Civil 3D Level I. Familiarity with civil engineering discipline. Project Management, understanding and manipulating styles, smart labeling, sites, advanced alignment creation, editing and labeling tools. Advanced Profile creation, labeling and editing tools, profile design, various profile views, superimposed profiles and sheet creation tools. Corridor assemblies and subassemblies, corridor creation, corridor surfaces, vertical and horizontal transitioning, intersection tools, volume computations, advanced section creation, labeling and editing. Grading tools including feature lines, daylighting, proposed surface creation, volume computation, and volume balancing techniques. Pipe design tools including calculations, drafting in plan and profile, and labeling. Also covered will be methods and theory of working effectively with and between Land Desktop and Civil Design. Includes a 148-page online manual, 26 exercises. This course is recommended for anyone who uses external databases, GIS, or facilities management information in conjunction with maps. Course emphasizes tools for linking and querying data in a graphical environment. AutoCAD (drafting) functionality will not be included in this course; please see AutoCAD classes for topics not relating to geographic data analysis. Recommended prerequisites: AutoCAD AutoCAD Level 1 and 2. Data query, analysis and editing, modification of entities from several drawings during one work session, database linking, viewing of MS Access and Dbase files through the project workspace, topology creation and editing, topology analysis, thematic mapping, boundary trimming, data exchange with other mapping products.